Blogging is weird sometimes. Which I hope I can say if you follow me, and apologize for doing so you’re someone who just stopped by in like 10 years to look at this recipe. But I make food, take a pic or two (or like a hundred, hoping to get a good one) and put it out there. And it’s kind of like having someone over for dinner. “Will you like it?” I wonder. Oh the angst. Well, I hope you’ll like this one. It’s a pork tenderloin and has the most marvelous peach glaze. (Um, maybe the title Peach Glazed Pork Tenderloin gave that away?) The final dish doesn’t really end up tasting like peaches, but more like some mysterious umami deliciousness. And it’s super simple to make. Bonus. Peach Glazed Pork Tenderloin can be grilled outside or in, like the original recipe suggests or done in the oven like I did. Coz it’s too hot to grill…are those words sacrilege?…so you have options. Honestly, I didn’t want to grill it inside and have to scrub up the crusty grill pan, either. That’s me, being lazy but happy. I served this with a suggested Watermelon Tomato Salad which needed quite a bit of tweaking, so that recipe will be coming up on its own post. I loved that salad (after the tweaking) but the folks were reluctant. Very reluctant. So maybe it’s too, too far out there for some people. My fave octogenarians wouldn’t even try the salad. Here’s the thing about Pork Tenderloin. Yeah, it’s delish and tender and juicy. It’s also perfect for a special family dinner or company when it’s “dressed up” but it’s not so expensive that it always has to be saved for a special occasion. Ideally, serve it with some great sides because tenderloins are not overly large. Pork tenderloin goes on sale pretty regularly and since they’re put out by producers (like Hormel) there may be coupons, so you can save some bank. Look for a sale that’s buy one, get one free and then (if your store lets you) use two $1.00 off coupons. You can see more about buying, prepping and tying a tenderloin, beef or pork, here. Watch out for cut down pork loins sold as the tenderloin; they’re not the same cut and someone’s trying to fool you by charging too much. Follow a coupon matching site and they’ll let you know when a deal like that comes up. Buy low. Always buy low. 🙂 And buy extra when you buy low and toss it in the freezer. 🙂 If you’ve never looked at the top line of my blog and clicked on my 12 Strategies to Keep Food Costs Low & Quality High, maybe you might want take a peek. Preheat oven to 400 degrees F. If desired and to cook evenly, tie off pork tenderloin at 1 1/2″ intervals. Heat an oven proof skillet over medium-high heat. Add a tablespoon or two of oil. Brown pork tenderloin well on all sides. While pork is cooking, combine preserves, soy sauce, vinegar and garlic in a microwave-safe bowl. Microwave at high in 30 second intervals, or until the preserves melt. If grilling, skip to Grill, below. If cooking in oven, continue. Brush the tenderloin with the preserves and place in oven for about 15 to 20 minutes, brushing the preserves on again, about halfway through cooking time and again when nearly done. Watch the residue at the bottom of the pan so it doesn’t burn, adding a little water if needed. Remove from oven when a thermometer registers 145°F to 160°F, depending on your preference. Remove to a cutting board or platter and let stand 3 minutes. Add another tablespoon or so of the preserves to the juices in the pan and pour over the pork if desired. Cut pork crosswise into slices. Sprinkle evenly with salt and pepper. Heat grill (or grill pan) to medium high heat. Rub grate or pan with oil. Rub a tablespoon of oil over pork. Add pork and loosely tent pork with foil. Grill 10 minutes, turning occasionally. Remove foil and grill pork 6 minutes more, or until thermometer registers 145°F to 160°F, turning and brushing frequently with peach glaze. Remove pork from pan; let stand 3 minutes. Cut pork crosswise into slices. Sprinkle evenly with salt and pepper. Discard any remaining glaze. This entry was posted in Click here for Bargain Meals, Click here for Fabulous Food Posts and tagged Bargain Meal of the Week, Frugal Hausfrau, Jam Jelly or Preserves, peach glazed pork tenderloin, peaches, Pork, Pork Tenderloin. Bookmark the permalink. Delicious. I’m all about peaches right now! 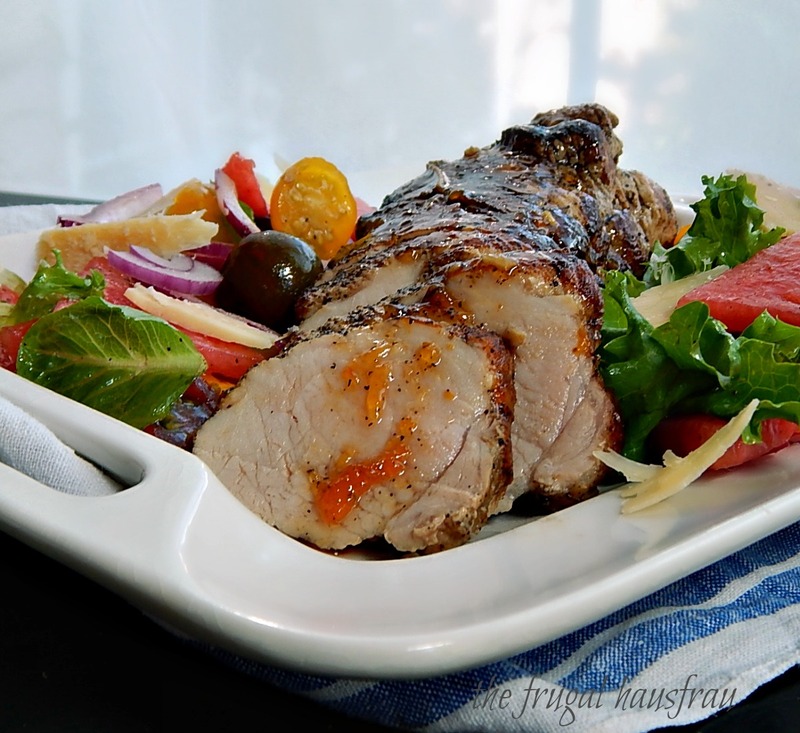 Your pork tenderloin looks really juicy and I love the combination. I often find it is dry, at least the ones I find here. I’ve had the best luck cooking them sous vide and then browning at the end. Hmmm…I don’t know, maybe. Pork loin looks quite different and sometimes has bones, pork tenderloin looks a little like beef tenderloin. Of course if you buy from a butcher, then you probably won’t ever run into that issue. Interesting, I have seen packaged marinated pork in the store but never thought of purchasing them since I make my own marinades. I will have to take a closer look. This all sure looks delicious to me, Mollie! Thanks, Jess. The pork was a big hit. 🙂 I think this is the first time I’ve paired pork with peaches. I’ve done rhubarb, apricot and of course apples! It looks fab Mollie…Love all the flavors going on, and I used to love all your tips when you first started blogging. I’ll have to refresh my memory and re-read your 12 Strategies. Well done! Thanks, Loretta! 🙂 I used to get all kinds of complaints about my posts being too long so I started trying to just give a little tip or two…and then sometimes I’d just forget. lol, go figure, did it come up in your reader? I’m making that salad with my changes tomorrow. I mean, jheez, they could have just eaten the tomatoes or the watermelon out of the salad…it was like two sulky children, lol!! LOL. I wouldn’t dare sulk if you were cooking me those meals! Best behavior from me. You come up in my reader but life is too short to go to reader in my world….so I read blogs in email or FB. I just never go to reader. Looks awesome! I love the Pork / Peach combo flavor! So good! This looks so very tasty. Love the addition of peaches. Thanks! Johanne just suggested peaches on the side, and I just came across a “peach salad” so next time I’m trying that with the pork. I know, right, lol!! Although I hafta admit my eating and cooking has been leaning towards the more traditional due to their tastes. Otherwise I’d probably be leaning more towards vegetarian, chickpeas & bean sprouts…lol! It’s beautiful Mollie!! Love the idea of peach with pork. I wonder if I could nestle it next to some grilled peach halves? It looks luscious! And– sorry the watermelon tomato salad wasn’t a hit– win some, lose some (I know all about that!) but I think it looks bright and delish! hugs blog-buddy! Hugs right back at you, and grilled peaches would be wonderful!! Hi! And thanks for the follow – and the lovely comments you’ve been sprinkling around! I’m Mollie and glad to have you here!